In August 2011, investigative reports from the Associated Press confirmed long-standing suspicions that the New York Police Department was participating in wholesale surveillance of Arabs and Muslims in the NY and across the Northeast. NYPD undercover officers infiltrated mosques, bookstores, cafes, restaurants and student associations on college campuses, creating dossiers of entire communities void of any criminal suspicion. The most recent set of leaked documents released in August 2013 reveals that not only were mosques subjected to "terrorism enterprise investigations," confidential informants made attempts to infiltrate the board of directors at the AAANY. As the NYPD engages in unwarranted surveillance of Muslim communities, police continued to target communities of color with tactics including stop and frisk. AAANY's campaign seeks to increase transparency and accountability within the NYPD and end discriminatory policing practices impacting people of color and religious minorities. We organize with the Muslim American Civil Liberties Coalition to build base of community members to end unwarranted NYPD surveillance. Concerns around wholesale spying of Muslim communities align with communities of color victim to the NYPD's stop and frisk policy. As a member of Communities United for Police Reform, we work to connect the dots between all forms of discriminatory policing. Cross community organizing strengthens the movement around national security reform and civil liberties. As a leading MACLC member, AAANY played a critical role passing the Community Safety Act, ushering an Inspector General to oversee the NYPD and an enforceable ban on profiling. As our legislative strategy enter its next phase. AAANY will be active in the process of implementing the Inspector General Bill of the CSA in 2014, when the new law goes into effect. There are currently three federal lawsuits challenging the NYPD's discriminatory policy of wholesale spying: Handschu v Special Services Division, Raza v City of NY, and Hassan v City of NY. With many of our community members hurting from a broken immigration system, the time has never been more right for Congress to support comprehensive immigration reform that keeps families together and upholds the dignity and respect all communities deserve. AAANY advocates for long-term solutions and immigration laws that ensure that all people, irrespective of status have access to equal rights and opportunities. As a member of New Yorkers for Real Immigration Reform, we organize to move elected officials to bring about meaningful reform that creates a pathway to citizenship, reunites and keeps families together and safeguards civil and human rights. AAANY’s voice on immigration reform remains critical as we highlight the need for due process and the elimination of immigration programs that use racial and religious profiling as a tactic to arrest and detain individuals. AAANY recognizes that one of the most effective ways to respond to challenges discriminatory policing practices and effectively advocate for immigrant rights, is to organize. Our long-term goal is to help develop and nurture the skills necessary for sustained civic participation of Arab and Muslim communities in NY. Understanding that community power is built over time, AAANY uses organizing tools like voter registration and mobilization to empower, engage, and increase voter representation during each election cycle. Every year, on their most sacred high holidays, 1 in 8 public school children is forced to make an unfair choice between their education and their faith. Eid Ul-Fitr celebrates the end of Ramadan, the sacred month of fasting. Eid Ul-Adha celebrates the end of the yearly pilgrimage to Mecca. "Eid" means celebration. The Coalition for Muslim School Holidays calls on Mayor Bill De Blasio and the Department of Education to incorporate one day each for those Muslim holidays as official school holidays in the public school calendar. Incorporating those two Muslims holidays would have a minimal impact on the school calendar as one or both of them often fall on a weekend, summer recess or another scheduled school holiday. The Coalition for Muslim School Holidays is prepared to work with Mayor De Blasio to recommend specific implementation strategies. For more information, please send an email to NYCMuslimSchoolHolidays@gmail.com. 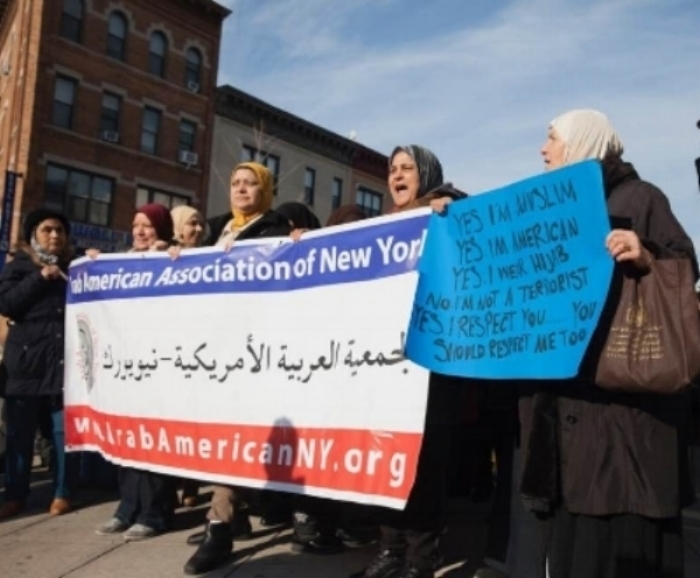 The Arab American Association of New York is committed to fully supporting and empowering Arab women individually and collectively. Our AWAL (Arab Women Activists and Leaders) Program is an organizing collective that connects Arab women and other women of color in New York City. Through creative and personalized programming, AWAL builds intra-community solidarity amongst women while cultivating a viable and empowering sisterhood network. The group also trains women to become organizers in their communities who raise political consciousness and mobilize around issues important to them. Learn more here.